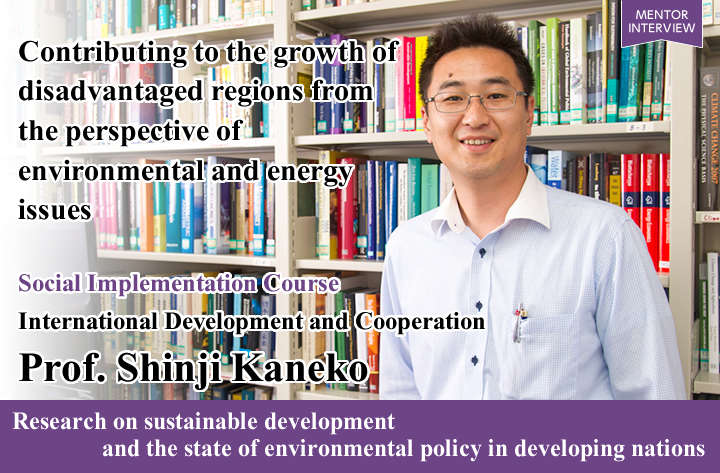 Professor Kaneko’s field of expertise is known as Environmental Economics. This discipline takes an economics-based approach to examine how to resolve environmental issues. The environment in this case includes pollution issues as well as resource and energy-related problems. Professor Kaneko says, “I define the issues broadly in my research. In the Graduate School for International Development and Cooperation, which I belong to, there is a particularly large number of international students from developing nations, and in many cases the research starts from issues that they are interested in”. 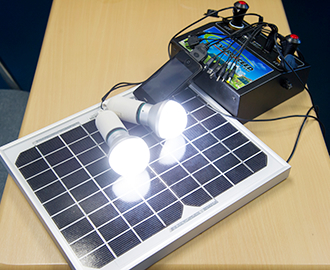 A specific example of recent research projects is ‘The spread and utilization of solar power generation in poor regions’. 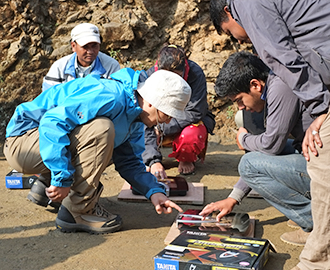 This included a research project initiated last year that examined how the lives of the people in a mountainous area of Nepal were changed by the introduction of a solar-powered water pumping system that draws water using energy generated using solar power. “A key feature of the research was that to identify the simple benefits that resulted from the launch of the pump, it was not possible to eliminate the affect of the characteristics of the village in question. Therefore, before the launch, we adopted a long-term monitoring method, where we took samples from an extremely large number of villages. Although this method is frequently used in the fields of education or medicine, it is still rare to use it in environmental research. This is a new initiative that we plan to adopt from now on”. Professor Kaneko says that villages in Nepal are ideal for this research because each village is made up of around 60-80 households and is extremely homogeneous. The plan is to conduct such fixed-point observation in the villages for the next 4-8 years. 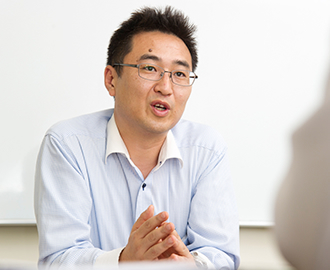 In the Taoyaka Program, Professor Kaneko teaches Global Environmental Policies. The Social Implementation Course targets the particularly disadvantaged regions in developing nations. He says that as there are extremely strong links between daily life, economic development and the surrounding environment, there is a need to learn about the field known as ‘environmental economics’. In Global Environmental Policies, students learn about what actions global society has taken in international negotiations on global environmental issues in the past, and how such issues are being addressed today. “The students learn about the mechanisms used to support developing nations, including financial support and technology transfers. This is knowledge that they definitely need, in particular in relation to resolving the issue of how to ensure that new technology is widely adopted in developing nations, and how such technology should be used”, says Professor Kaneko. “For example, in the case of the solar-powered pumping system that I mentioned before – by introducing this technology, drawing water becomes much easier and helps to greatly improve the workload of women working at home. Ideally, the women could use the time saved to grow more crops and thus increase their income, but what we see actually happening in South America and Africa is that they have more children and become poorer. International agencies and NGOs tend to adopt an external perspective and think that more and more technology should be introduced, but this could actually make the situation worse”. Professor Kaneko says that by learning in detail about past case studies and phenomena in this way, the students consider whether or not new technology is beneficial for a community, and then have to think together about what should be done to make it beneficial. As environmental studies is originally an interdisciplinary field, Professor Kaneko reflects that he himself has strong links with other teachers working in many different fields, and that this has helped him to develop flexibility in dealing with issues that actually occur. Moreover, in his position as organizer of the Social Implementation Course, it is necessary to cooperate across disciplines to achieve the program’s goal of directly contributing to disadvantaged regions. He praises the significance of this. “The various issues faced by developing nations, such as poverty and conflict, are by no means unrelated to us in advanced nations. Providing support for such societies and contributing to their development is, in the long term, related to the stable development of global society. That is what ‘international cooperation’ is for”. In response to the trend of leaving aid work up to those traditionally involved in such work, he says “I want groups that may seem to have nothing to do with this, such as people involved in the development of state-of-the-art technology for instance, to start focusing on issues like this. I truly hope that more and more researchers and practitioners from various different fields start working together on things like this”. “When you go to a developing nation, the life there tends to look simple, initially. But the more you know about it, the more you see that there are a lot of quite complicated issues and the situation is difficult. I first want the students to equip themselves with adequate knowledge, and then think about what they can do themselves. I actually don’t think it is such a difficult thing to do. But to execute that kind of thing, the students need not only knowledge – they also need to work on their own emotional and physical development. As teachers, we will be providing them with full back-up support”. 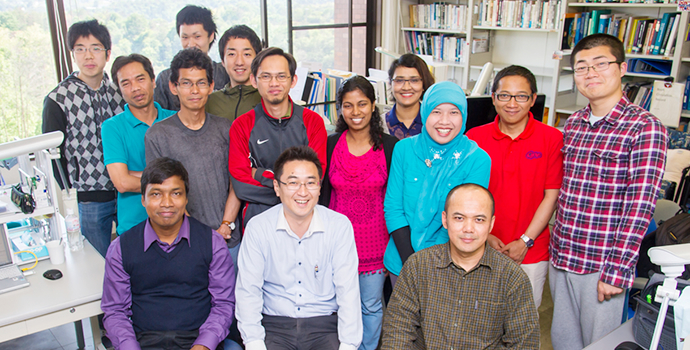 Currently Professor Kaneko has one international student from Bangladesh under his care. He says that he has high expectations for motivated engagement by his student in the future.